Interests INDUSTRIAL/PROCESS AUTOMATION, ELECTRICAL SWITCHGEARS . Convert analog KW to KWH daily total. Thanks a Lot Sir Steve Bailey you were always here to assist Us! But Can Anyone figure Out what i am doing wrong that not letting me to display 32bit data. 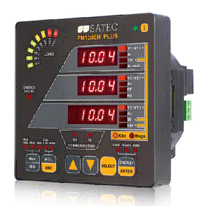 I have checked the satec PM130EH MFM meter modbus register manual, found there two sets of 16bit scaled energy counters/registers one is lowOrder & other is highOrder. And done a Conversion for getting the desired output without altering any variable's data type(as on doing so it generates error10808) and validate my project which generates no error but on uploading data to GE IP controller .. Nothing fruitful happens on cim HMI screen. Steve Bailey as you have previously assisted me ..on how to get 32bit data from 16bit registers, i have attached pics of LD on which i have made some changes (and i have 4days left for activating PME thats Y iam able to do modifications!) Is i am getting it totally wrong?? Does my preExisting point(ACT_ENRG_IM) having INT_16bit property will able to put 8digits long interger value on cim screen? Actually i was working on getting the 32bit large data by 2-16bit consecutive addresses and doing little convertion of adding high order and low order datas to get my energy kwh readings which is greater than what a 16bit data can holds. But on validating it generates error code 10808, may be i have to change the data type of my kwh output from workbench too?? But workbench is logoff , asks for Management logOn! I think This Will definitely Solve the Problem!! Wow...ThankYou Very Much...!! Since From 5th of jan.2017 its been 2weeks i didn't get my query answered on my level. :( Sry.. ! " In the GE PLC, a 32-bit integer resides in two consecutive %R addresses. You appear to only be displaying one of them " Now, Do i have to create 2 consecutive %R addresses for each Feeder's PowerMeter as i cant add another Address consecutive to the present one as all of them already associated to other Points :( , To do the same, Is there Other Easy & Simple way i am totally missing ?? Thank You very much for yours valuable Reply. Sry, I am New to GE-Cimplicity Platform.